Heat oven to 350°F. Make and bake brownies as directed on box for 8-inch square pan. Remove from oven. 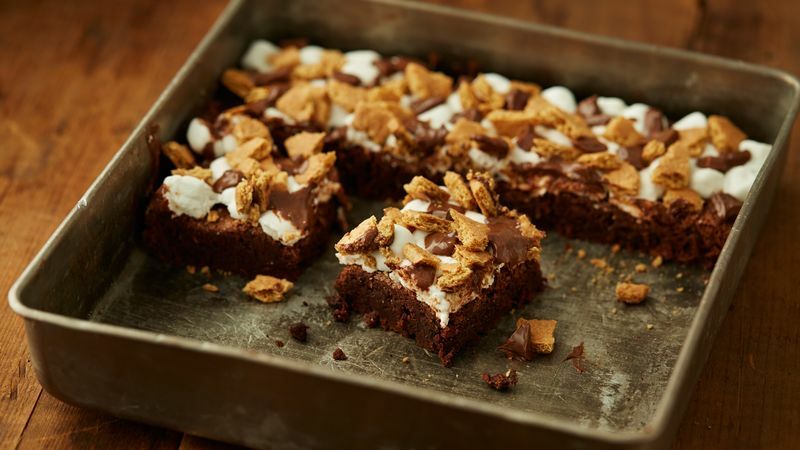 Immediately sprinkle marshmallows over warm brownies. Bake 2 to 3 minutes or until marshmallows are puffed. Remove from oven; sprinkle with candy and graham cracker pieces. Cool 1 hour. Cut into 4 rows by 4 rows. Make it easier to remove brownies by lining pan with foil, with enough hanging over edges to lift out of pan. Spray foil with cooking spray. To cut brownies, use sharp knife sprayed with cooking spray. Store brownies in covered container.